Back taxes are not an issue that anyone wants to deal with. They can cause a lot of issues with your credit and how much you are able to do with your life. It is best to make full payments on your taxes as soon as you find out that you owe on taxes, and long before the due date, so you never have to worry about having a late payment and all the headaches that it can cause. If nothing else, make sure that you come up with a payment plan for tax debts that you aren’t able to pay off in full and keep up with these payments on time each month. Failing to pay your due taxes and getting stuck with back taxes can hurt you in many ways. You could deal with interest and fees accumulating on your taxes, dealing with bad credit, having money taken out of your wages each pay period, and having levies placed on your property until the amount is paid off. If you are dealing with back taxes, make sure to talk to your tax professional as soon as possible to get this taken care of. The first thing that you are going to notice when you have a tax debt is that interest and fees are going to start accumulating from the day that the debt goes overdue. If you file the taxes in February, you will have until the tax due date in April to pay them off. If you pay in March, you will not owe these extra charges. But if you pay in May, fees and penalties will be added. While this may not seem like such a big deal, it can quickly add up. 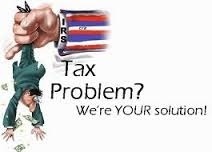 You may find that you are dealing with hundreds, if not more, extra debt if you let the tax debt go on too long. From the very first day that you are late until the moment that you make the payment, you could be dealing with these extra fees. Talk to your tax professional to find out more about these tax fess and how they pertain to you. While it may take some time before you get to this point with your tax debt, at some point, the IRS is able to start taking some of your wages in order to pay back the amount that you owe. This could leave you with a lot less money each month (the IRS will take what they want and not worry about how much you need to survive or pay your other bills through the month) and you may have to scrounge to make it by. Some people assume that the IRS is not going to be able to figure out where they work or just won’t go through the effort. But since the IRS is a government entity and your employer has to send in information about your employment each year, it doesn’t take too much for the IRS to figure out where you work so they can take the money that you owe. To avoid this issue, make sure to take care of your tax debts as soon as possible. One thing that you may be surprised about is that you will not be able to get future refunds if you owe a tax debt. Many people assume that since these are separate tax returns and happen at different times that they should be able to get a refund even when they owed a tax debt. But the IRS is going to continue to hold onto your future refunds until the tax debt is paid in full. This means you could be missing out on tax refunds even if you qualify for them in future years. Having a debt to the IRS is one of the worst debts that you can deal with. It can really ruin your credit and make it impossible to purchase the things that you would like. It does not matter how little the tax debt may be, if you ignore it for long enough, it can end up on the tax return and completely ruin your credit history. You will find that it is impossible to purchase a home, get a credit card, or do anything else that you would like with your financial freedom. One issue that you could face is a levy on your personal property. If you own a vehicle, a home, or any other property, the IRS will be able to claim a bit of it as their own. This levy is hard to remove and you will not be allowed to get rid of the property until you pay them back. Many times someone will not purchase the property with this kind of levy in the first place. It could take many months, even after paying off the debt, to get this levy taken care, so get that tax debt taken care of as soon as possible. To avoid issues with back taxes, or to learn some of your options if you are already dealing with a tax debt, contact us today.